Working with two-year-olds is a lively experience. Twos are sweet, courageous, and touchy at the same time. They are not terrible, as people sometimes say. They are terrific! They are full of giggles and mischief and everything is new and exciting to them. Throughout each day, they are constantly finding out how things work and what happens next. They are gaining independence and learning about themselves and the world around them. Their egocentrism is transforming into awareness. They are developing important social, emotional, cognitive, and physical skills. Twos are not babies anymore, but they are not preschoolers yet. They are toddlers. As teachers of two year old children, we experience tremendous growth day by day. This age group needs an approach and an environment that is different from a nursery or transition classroom for three and four year olds. For most of our children, EY1 is the very first place where they are separated from their parents and introduced to a group of other children. It is our job and our mission, to make this transition as smooth as possible, for both the children antheir families. More than teachers, we are loving caregivers and partners in learning. At this age, many children still need their milk bottle before taking an afternoon nap; some of them wear nappies, while others have just started to be toilet trained. Some of our children talk a lot, some are shy or don't yet have enough language to express themselves verbally. Every child is different, with different characteristics and different needs, but they all need our attention and love. Getting to know our children, building strong relationships and earning their trust are our primary goals. Being aware of a child's previous knowledge and learning about her or his needs allows us to prepare an individual plan. When you visit our class, it might look like all the children work on the same art project, listen to the same story and play with the same toys. It is not like that. Instead, we differentiate within an activity to cover all children's levels and to extend their learning following their personal paths. We ask different questions, we encourage different ways to play or pretend, we extend vocabulary at different levels. 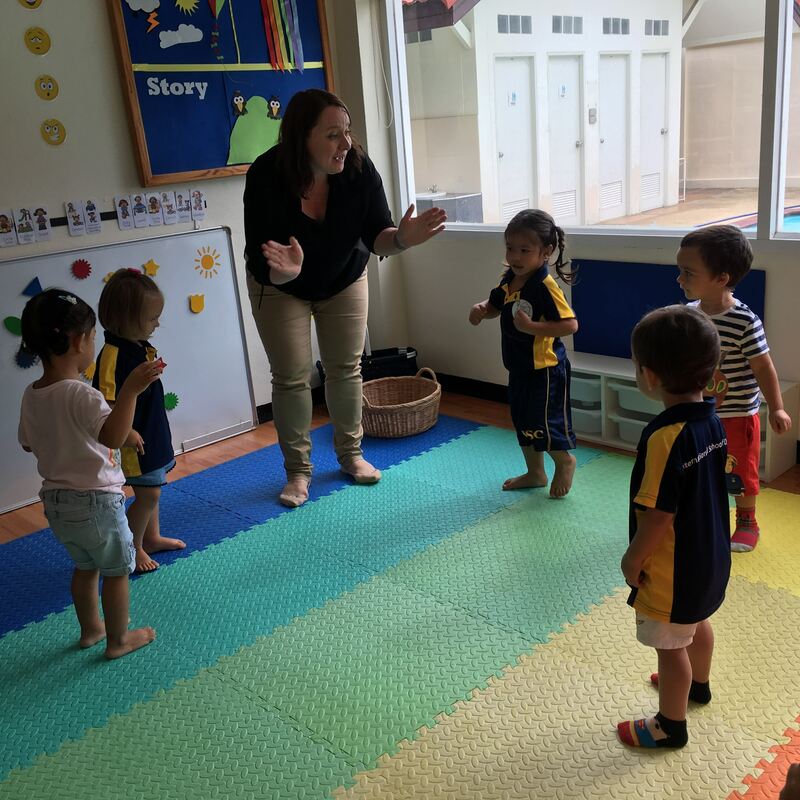 The days in our EY1 (pre-nursery) class are organised around routines. The carefully planned routines help us to build a consistent classroom community. Routines support children’s developing abilities to do things on their own. As the students arrive, they place their bags in their assigned cubbies and sign-in by posting a wooden tag with their names and geometric colour symbol on the board. This process not only builds a sense of community but also supports early maths and literacy skills. After signing in, the children reach the table area with process art, sensory play, manipulatives or maths and literacy games. These small group workshops give us a chance to cuddle, give dedicated individual attention, and ask personalised questions to every single child. From the beginning of the day, we let our children know that they count and we are here for them. The children decide how much time they want to spend on the morning activity. Once done, they move to play with other children. Before snack, we all go to the music room for our circle time. ISC’s outdoor environment was carefully designed to guarantee safety and satisfy the needs of even the youngest children We have large natural grass areas, riding paths, wooden climbing facilities and swings, covered sala for rainy days, and much more. The playgrounds have become an extension of our classroom. We open our doors several times a day to run about, burn energy and explore the world. We sing and dance, read stories, chant nursery rhymes, do art projects, play with water, climb, jump, kick balls, play in the sandpit or in the little house, build with blocks, and have fun in the fresh air. There is always so much to see, hear, and touch. Once a day, the class splits into two groups. While one group attends a specialist class - either music, art, Thai culture, P.E. or swimming, the other group works with the classroom teacher. The activities vary every day; interactive storytimes with puppets, cooking, science projects, or games. Some of our students leave school after lunch; the others have an afternoon rest time. Most of them fall asleep while listening to an audio story and getting a gentle foot, hand, or back massage from us. A cuddle comes naturally before the children go home. Our class is like a big family. We love and respect each other. There is nothing more satisfying than the children happily running into the classroom every morning shouting; "I am here, I am here".